What is a liveaboard cruise? 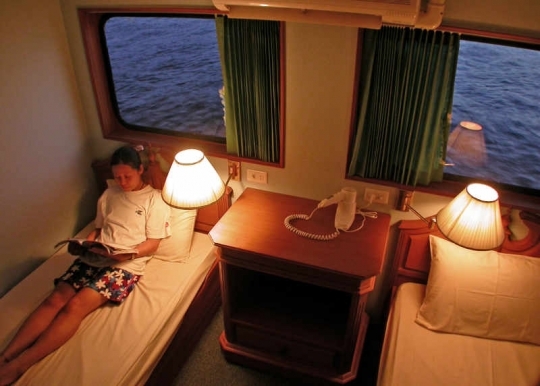 Thailand liveaboards provide facilities and living accommodations for scuba divers. You eat, sleep and dive on the boat! They stay at sea for the duration of a cruise and so can explore more remote dive sites. This type of diving opens up a whole world of top class opportunities that would simply not be available on a regular day trip boat. 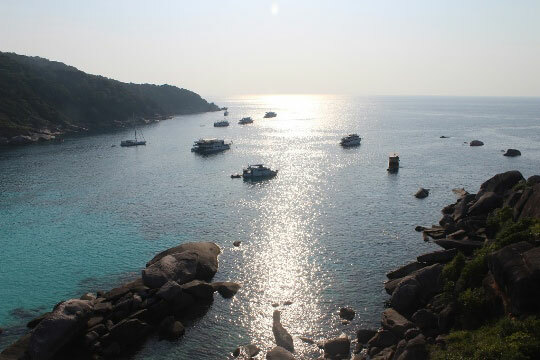 Destinations include the Similans and Surin Islands, Hin Daeng - Hin Muang as well as the Mergui Archipelago (Burma). Generally you can make 4 dives a day. 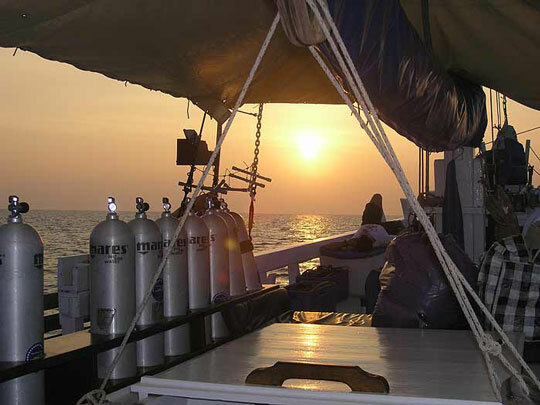 A typical day starts at 07:00 hrs with the first dive; the last being either a sunset or night dive. You have about 3 hours between dives at your leisure. 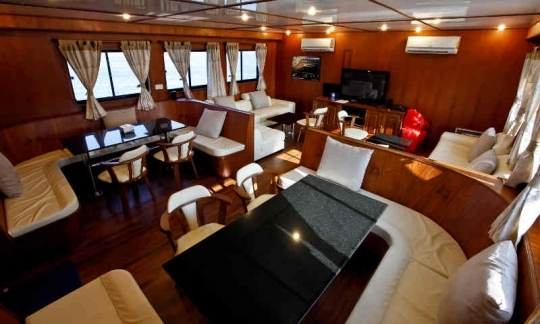 The Similan liveaboards season runs from October to May. The weather and Andaman Sea are at their calmest during the months of February to early May, and this is when visibility is at its best. This time of year is also manta ray and whale shark season. What diving license do I need? 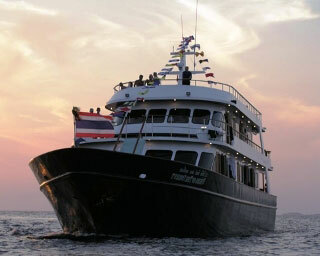 An open water scuba license is acceptable for Thailand liveaboard safaris. 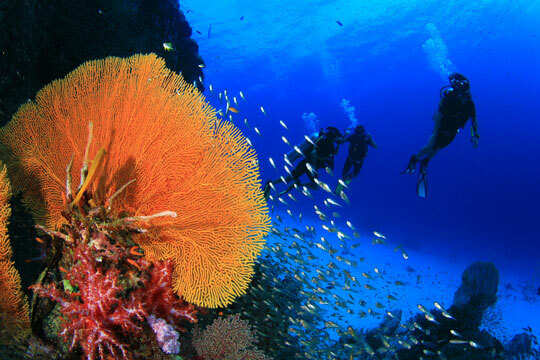 Although there are some deep and exposed sites, there are enough easy sites and enough divemasters on board so that you will never need to dive beyond your limits. To make the most of your adventure and to extend your scuba training you may wish to take your PADI Advanced Open Water Diver license on board. Certification is normally discounted to about half price. Review the "Facilities" section of each boat for course prices on board. Is dive insurance really free if I book with Dive The World? Yes! If it is your first time booking with us you can qualify for free diving insurance for the duration of your booking. This offer is only for bookings in excess of USD 1 000 per person. 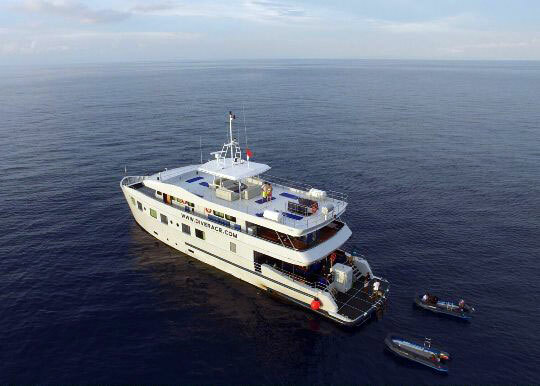 Although it is possible to book some Thailand diving safaris only a few weeks before departure, if you want to ensure your place on one of our most popular Similan liveaboard charter cruises between December and April you must try to book 6 months in advance. Some of the diving sites visited can have strong currents. This depends on the site, time of month and time of day. Your guide will advise you in your pre-dive briefings. Generally, there is never an occasion when you need to swim against a strong current. I don't have my scuba license with me, can I still dive? If you have a PADI certification, we can check your details direct with PADI. Please provide your name as it appears on your card and your date of birth. If you contact the scuba centre where you were certified, they can help you obtain a new card before you travel. Can I dive on my own? 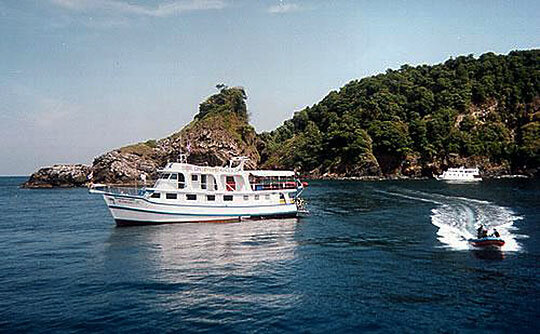 Phuket liveaboards are recreational diving cruise charters, and as such follow recreational scuba guidelines. This means you'll be expected to dive with a buddy to a maximum depth of 40 metres and observe safe diving limits. If you prefer to dive without a guide, then this is not a problem provided you have all the equipment necessary to conduct dives unassisted i.e. dive computer or timing device, safety balloon, compass and diveknife. Although the Andaman Sea is very warm at 27 to 30°C, you will get chilled making 4 dives every day on your Thailand diving cruise. We recommend at least a 3mm wetsuit shortie, or more if you are susceptible to heat loss. 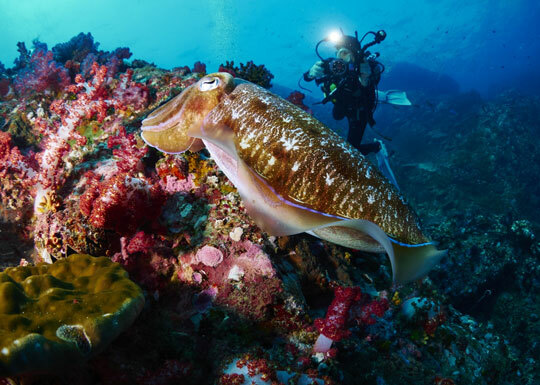 A wetsuit also provides protection from jellyfish and poor buoyancy control (easily rectified by taking your PADI Peak Performance Bouyancy course). Can I recharge my strobes and batteries? 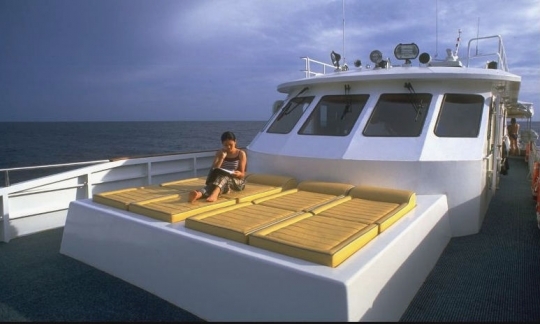 Usually this is not a problem on board liveaboards in Thailand. Please review the "Specs" section for details of the power sources provided on each trip. 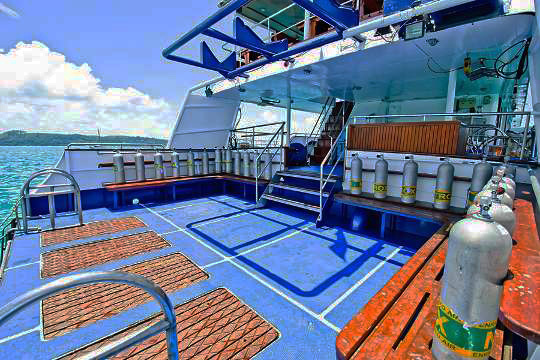 Nearly all Thailand diving charters carry 12 litre aluminium tanks with yoke or A-clamp international valves as standard. If you have a DIN regulator, you should bring an adaptor, or you can rent (US$ 3 per day) or buy one here. 10 or 15 litre tanks are also available for rent in advance. Enriched air nitrox is available on some boats. See the "Facilities" information section of each boat for more details. 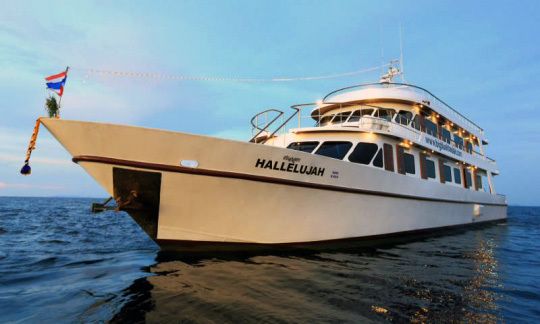 We have digital cameras (US$ 31 per day) available for rent on your Similan liveaboard cruise. Please request these in advance to ensure availability. Please review the "Food" section for details of food served on each of the cruises. Generally, the standard of cuisine is excellent throughout the Thailand diving safari industry. Not a problem but please do tell us your requirements at the time you make your booking, so that we can meet your request. 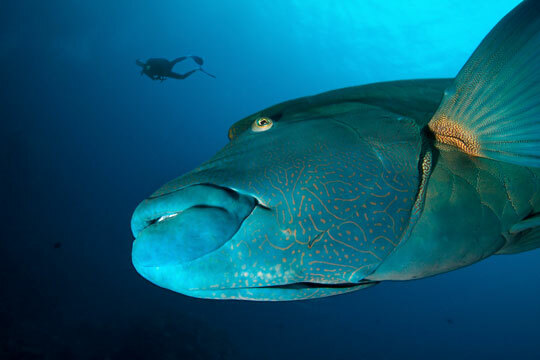 You can bring what you like on board Similan diving liveaboards. If you have a favourite tipple or taste, feel free to bring it along. Just be very aware that you cannot drink and dive. 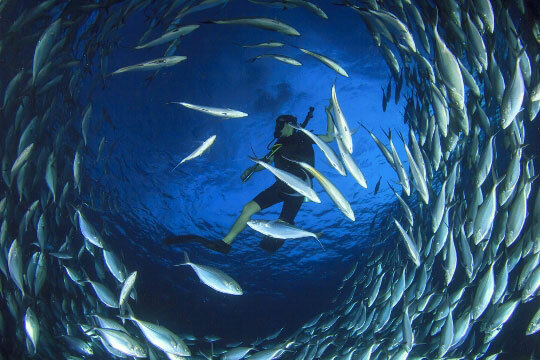 We can arrange transfers to your liveaboard from your Phuket hotel, from our diving centre or from the airport if you arrive just before your boat departure. Please advise us of your preferred transfer point before you arrive. All the charter boats use mooring points to over-night at the islands visited on the cruise. These mooring points are located in the island's bays, sheltered away from any open sea swells. 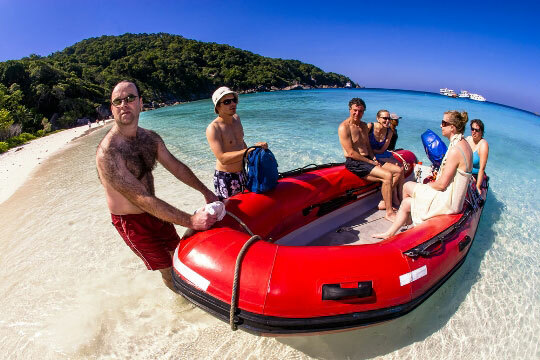 If you are particularly susceptible to motion sickness, then you should consider joining a Similan Islands trip in February to April, when the seas are very calm. Is dive insurance for customers included in the cruise price? 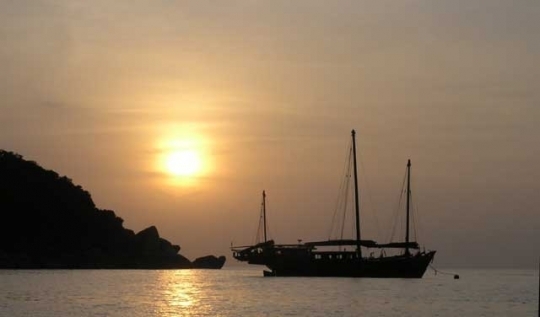 All the destinations for Thailand diving safaris are free of Malaria. Non-divers and snorkellers are always welcome on board. 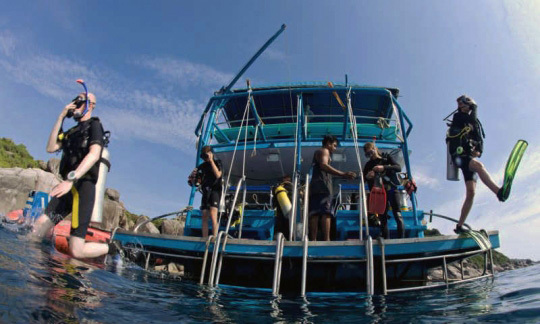 Most of the dive sites visited offer good snorkelling too, particularly liveaboards to Similan Islands. Do bear in mind though that the Thailand diving cruises are designed for scuba, not snorkelling. Prices for non-divers are usually discounted 10%, sometimes more, but please ask for exact details. 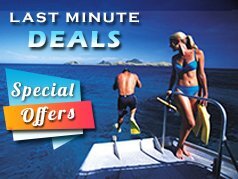 Although this sounds quite a small discount, boat operators will tell you that if you are not underwater then you will be on the boat eating all the food! Anyway, you are taking the space that would otherwise be available to a diver. 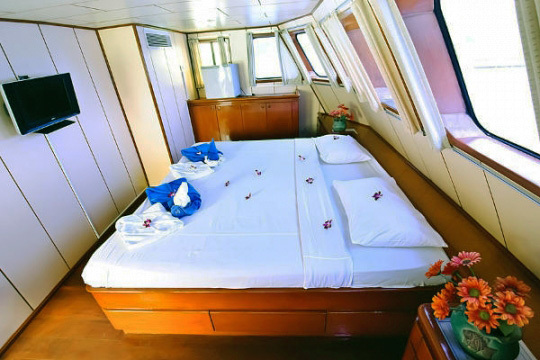 Space on liveaboard boats is the ultimate premium and single cabins are extremely rare and expensive. Unless we manage to book you a single cabin, you will be expected to share. It may be, if the boat is not full and there are an odd number of passengers, that you can have your own cabin, but this situation can not be guaranteed. The only way to guarantee a cabin for yourself is to pay for 2 beds! 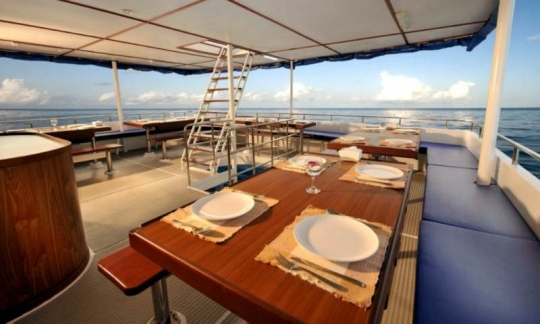 Please review the 'Cabins' information section of each Phuket charter for more details on the types of cabin available. 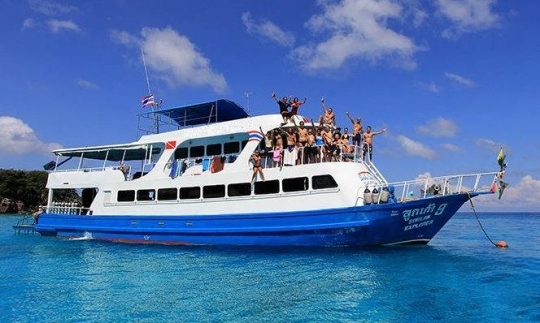 You have 3 hours surface interval between dives, so as long as you are not travelling between sites, you are free to do want you want on board Similan liveaboards. Please do advise the tour leader before and each time you disembark from the boat. Tipping in Thailand is entirely a matter of choice. If your liveaboard charter met or exceeded your expectations, you may wish to leave a tip of up to 10% of your cruise price. Smaller tips are welcome too! We certainly hope so! 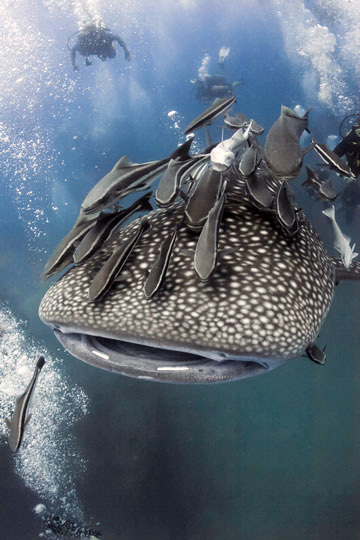 Leopard sharks and white-tip reef sharks are the most common and seen on all Similans trips. Nurse sharks and silver-tip sharks can be seen quite commonly on Burma liveaboards. Whale sharks sightings are pretty frequent too - keep your fingers crossed! Manta rays sightings have been very common recently, and you will always see blue-spotted sting rays, marble rays, and fantail rays.